Tidiness is a very pleasant thing inside a house. Outside, in a yard or garden, it’s not at all a good thing. 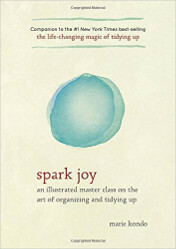 I’m really tired of the cult of tidy. We seem to be confused. We conflate our yards with our living rooms, the space beneath our shrubs for kitchen floors. Popular opinion seems to believe our flower and vegetable gardens should be maintained like trophy rooms, like curio cases. Our mistake, of course, is thinking that everything is about us. That our yard, our garden, our little patch of land actually belongs to us and we have the right to maintain it exactly as we like. We might own it on paper, but we share it with hundreds, thousands, millions (if you want to get into soil biology) of other lives. Of course, if we maintain our yards to exact standards of tidiness–say our yard consists of a lawn and some shrubs along the drive with the dirt beneath them blown clean, we probably are not supporting much life at all. We’ve put up the No Trespassing sign, and creatures listen. It gets even more sparse if we spray herbicides and pesticides all over the place. All of the invisible life vanishes. Any creatures which visit are just passing through. The land is eerily silent. But life is waiting to come back. That is what is so amazing. It jumps back if given even half a chance. If you open the door just a crack. All we have to do is sit back and relax. Stop with the obsessive yard work. Stop paying the yard crew. Leave the leaves. Let fallen leaves and pulled weeds stay on the land to protect and nourish the soil. Let your garden go to seed. If we live with fussy neighbors, or under the impression that our gardens should look like the ones in the magazines, we might work hard to keep our vegetable and flower gardens impeccable, starting seedlings in advance to replace aging plants so there’s never any sense of “decline” in the garden. I’ve always let parts of our garden go to seed, but this year, more than ever, I’m attuned to it. I’m reveling in the beauty in it, and I’m understand the generosity of it down deep, on the soul level. 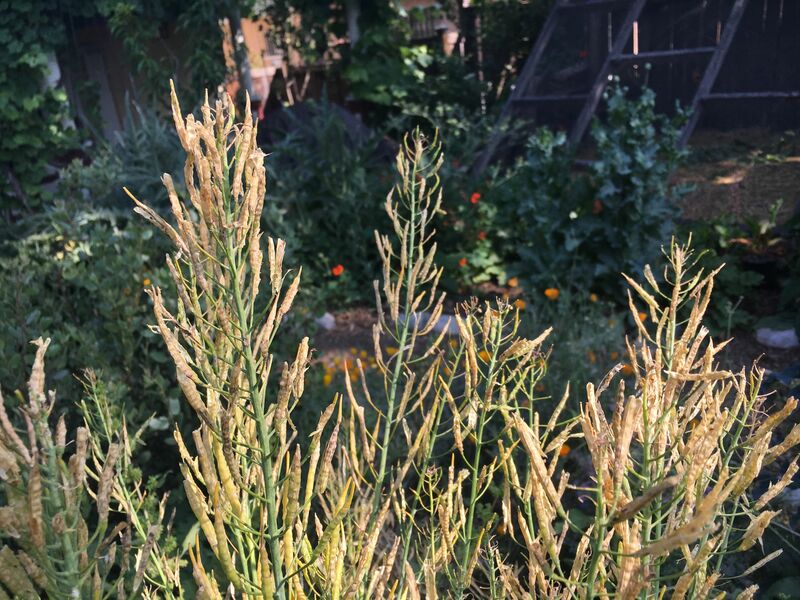 In the past I struggled to leave the plants as long as I could stand it, knowing they were doing good in their later life cycle, but also feeling like my yellow, straggly garden made me look lazy or incompetent. I was also acutely aware of the long gaps between harvests that would occur if I waited for plants to go to seed before replacing them. Now, I’ve given up all that anxiety, and I revel in this time. 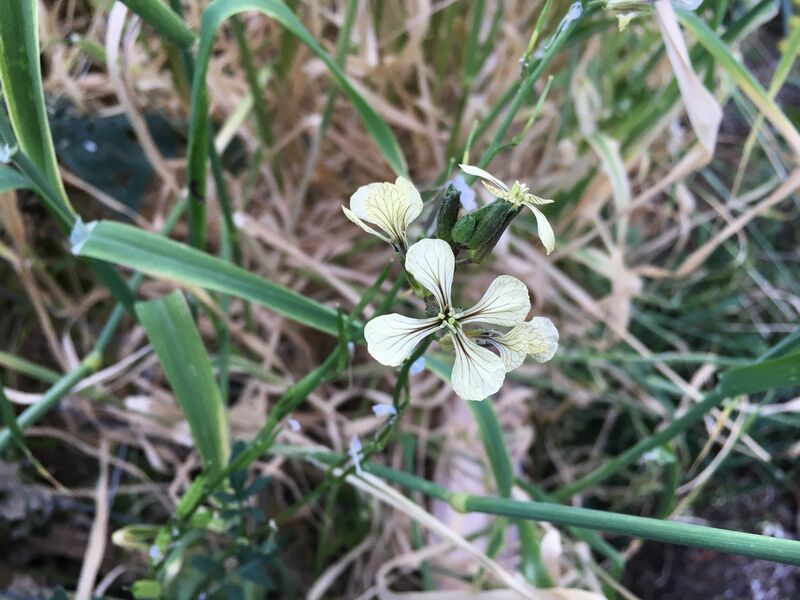 The insects feast on the flowers which bloom on our lettuce, our arugula, our radishes, our mustard, our fennel. Predatory wasps hunt alongside lady bugs and diligent bees of all types. We have more birds than ever in our yard, and they love our overgrown, browning beds, because of course they’re eating the seeds or the bugs on the ripening plants. They would not, however, allow me to take any pictures of them doing these things. They love all the weedy places, the vacant lots and over grown side yards. Those places are full of flashing wings and trilling songs. It’s already a seed time of year here in LA on our fast moving calendar, and I’m watching the birds feast. I love watching the little finches balancing on thin, swaying plant stalks in the golden light of the afternoon. The world is full of moments of perfect, unconscious beauty like that. Once the seeds are eaten, and the plants are brown and empty, I cut the stalks down at their base, but I don’t throw anything away. Everything stays in the yard, on or in the ground. The plant which fed us and the bee and the finch will now finish its work feeding the soil. Feeding the soil is its deepest work. And–never worry!– some seed always manages to hit the ground despite all the competition, ensuring volunteers will come up next year, and feed us all again. 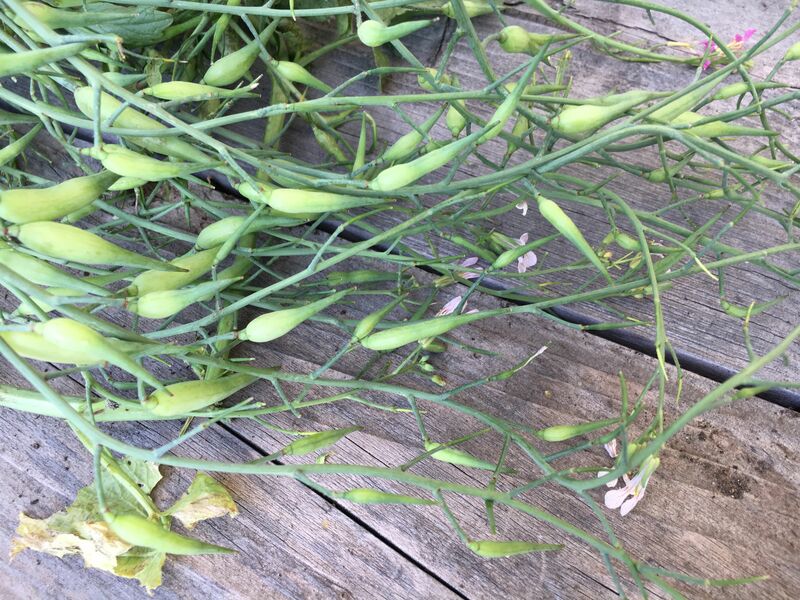 One area where I have to admit that I am less than generous is in the matter of radish seed pods. These I don’t leave for the birds, because I like them so much. 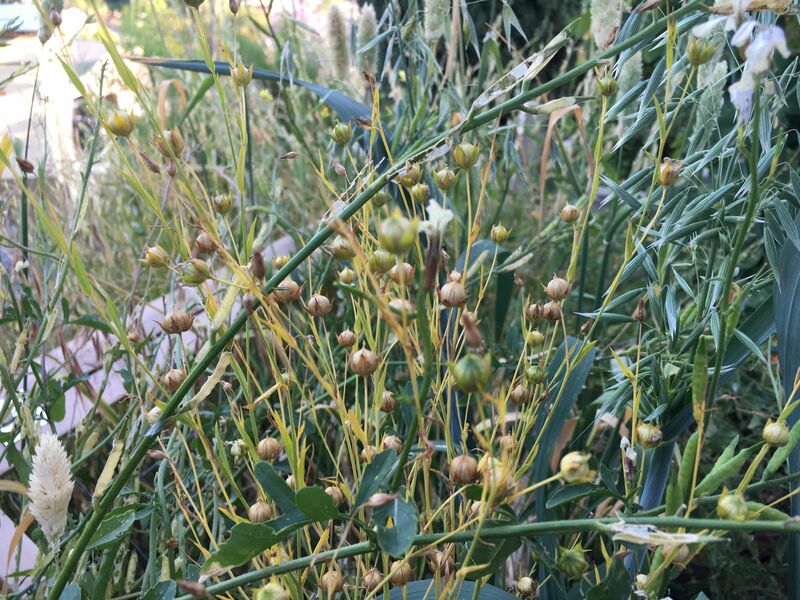 Most of you gardeners are probably very familiar with radish seed pods. If you aren’t, they are the fat little pods that show up after a radish plant of any type goes to seed. They taste like radishes, pretty much, sometimes they’re sweeter, sometimes they’re spicier. 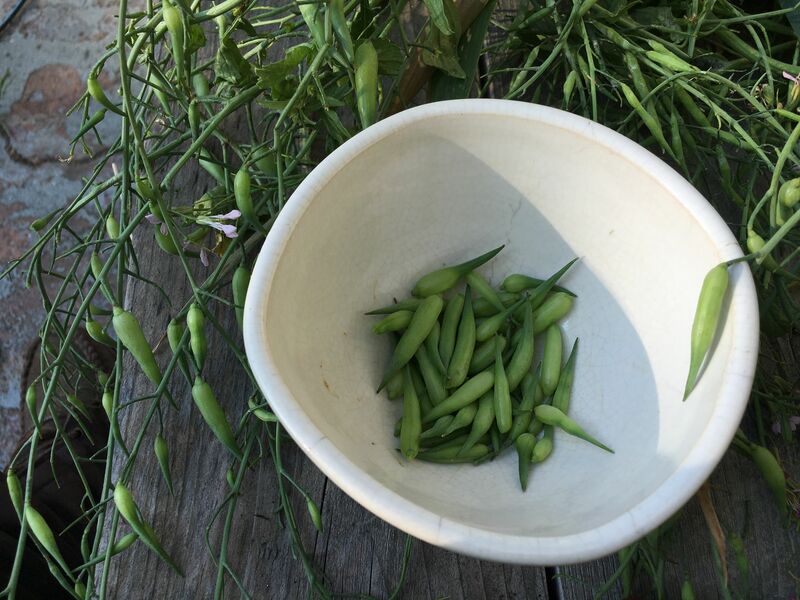 Radish pods are both a bonus crop and a fine consolation prize, because even if your radish roots end up puny or woody or otherwise disappointing, you can always eat the pods. They’re best fresh, picked a handful at a time as a snack or to put in a salad, but you can lactoferment or pickle them, too, using pretty much any pickle recipe you prefer. I’ve been avoiding writing about the front yard project’s developments because, frankly, I’m not sure what is going on out there. It’s a little crazy. The first flush of spring color, the wildflowers and other annuals which bloom with the winter rains, is almost gone now, while the summer bloomers haven’t kicked in. This is what I see if I go out and peer at my slope–a tangle of plants, some of which are doing better than others. What everyone else sees are the sunflowers. We have sunflowers. Lots of them. 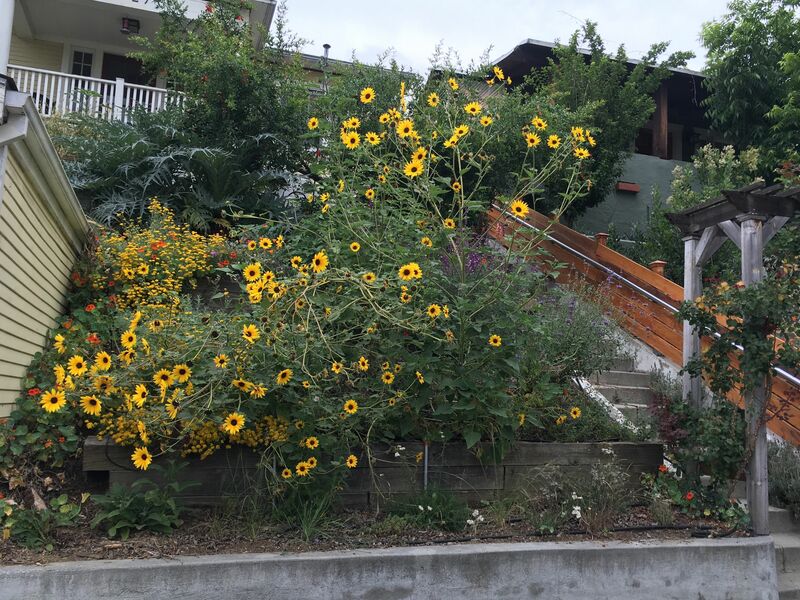 They’re wild sunflowers–not the kind that produce the big seeds, but the kind that grow along the freeway. I suspect these come from that big sunflower that I let grow up at the top of the hill last year which was, most likely, a hybridized descendant of an ornamental sunflower, “Lemon Queen” that Erik planted for the Great Sunflower Project several years ago. I pulled many, many seedlings but decided to let a few grow (four, I think?) on the slope, just to see what would happen. First, I believe in the power of volunteers. They want to be exactly where they’ve sprouted, so they tend to do very well. Why pull a happy volunteer and hope the transplant you’re trying to coerce to live in that spot will do just as well? Most likely it won’t. Also, sunflowers are very popular with the birds and the bees, and this yard is supposed to be about feeding those guys. And finally, I had this notion that they might provide some shade from the harsh sun for young plants. That they do, but of course they’re also causing chaos. This is a perpetual problem for me, balancing the exuberance of annual volunteers, such as Nasturtiums, California poppies and sunflowers with the needs of the the less showy perennial plants. I love the seasonal color brought by the spring annuals, but I also have to patrol to make sure they’re not smothering any of my perennials. Inevitably, I miss a few. Out on the front slope right now, the perennials are holding on beneath the sunflowers. Some are doing fine, some may be a little stunted. The risk I’m running is that the whole center of the slope will look terrible when the sunflowers go. For this reason, I should take them out now. This is what I think every day, but I just can’t do it. I like them, and as I said, they’re feeding lots of creatures. These sunflowers are not native sunflowers. The native sunflower is shorter and better behaved. I might try to swap those out for these guys next year, though these guys may be hard to dissuade. Some of the wildflowers earlier this spring: The pink are clarkia, the white is yarrow, the orange are Nasturtium (not wildflowers), the purple are Phacelia tanacetifolia. 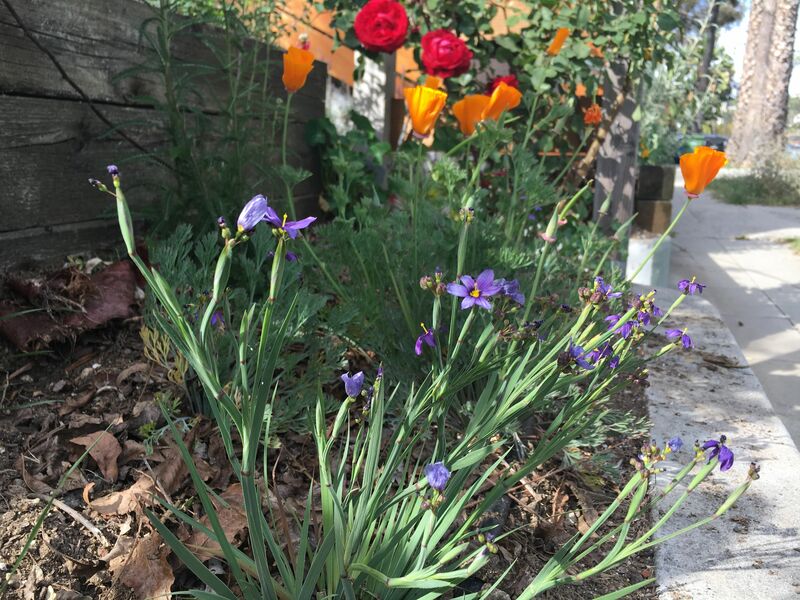 I threw down a good deal of native California wildflower seed last fall, hoping to fill my barren slope come spring with lots of amazing wildflower action. That did not pan out. I figure birds might have nabbed the seed, although wildflowers are fussy things, so maybe just decided they didn’t like the conditions. In terms of the birds, I did mix about half of the seeds with clay before seeding to protect them from the birds. Maybe the clay coated seeds were the only ones that sprouted? Or maybe that didn’t work at all? Who can tell? I knew this planting would be full of surprises, because I’m unfamiliar with many of the plants I used. So I’m figuring out how they grow and what they like and how they get along. It’s all an ongoing experiment. The golden yarrow is the small yellow flower in this picture. Surprise number one is Golden Yarrow (Eriophyllum confertiflorum) which is not a true yarrow at all. This was supposed to be a relatively small plant, maybe one foot high by two feet wide. I planted 3, and they’ve taken over the left side of the slope. Obviously, they like sunny hillsides! But you know, that side of the slope gets some shade, too, and the shade patches aren’t putting them off, either. Nor are the sunflowers. Really, between the Golden Yarrow and the sunflowers its a miracle that anything else has room to grow. I give the Eriophyllum confertiflorum a big thumbs up for being an attractive, fast-growing plant. It’s also supposed to be good for butterflies, though I haven’t noticed any butterfly interest in the blooms yet. It’s been blooming since early spring, and it’s categorized as a spring/summer bloomer, so it will be interesting to see how long the bloom lasts. I like this plant, but I didn’t really intend to cover the entire hillside with it, so I may need to take some action to make it play nice with others. Or, I could just let it take over the whole slope, pour myself a cocktail and call it quits on the landscaping. It wouldn’t be the worse solution in the world. Surprise #2 is how hard it is to get grass to grow. Native grasses remain a mystery to me. I lost many of the grasses I planted this winter and others are growing slowly. I bought new grass to replace the lost ones, and it’s doing okay, but is a little lost in the crowd on the slope. I’m hoping that it will start reseeding itself, because I don’t want to buy any more of it. I’m figuring that getting a meadow situation started will take time –and the cooperation of the grass. If it likes the slope, I’ll get a grassy meadow in coming years, but not this year. If grass is not to be, I’ll have to punt. And yes, it may have been more sensible (certainly more affordable) to scatter native grass seed instead of buying plants, but considering how well my wildflower seed did, I suspect it would have all gone into bird bellies as well. A pleasant surprise: blue-eyed grass. What a pretty plant it is! Unfortunately it is summer deciduous, so it’s on its way out. On the upside, it reseeds itself. 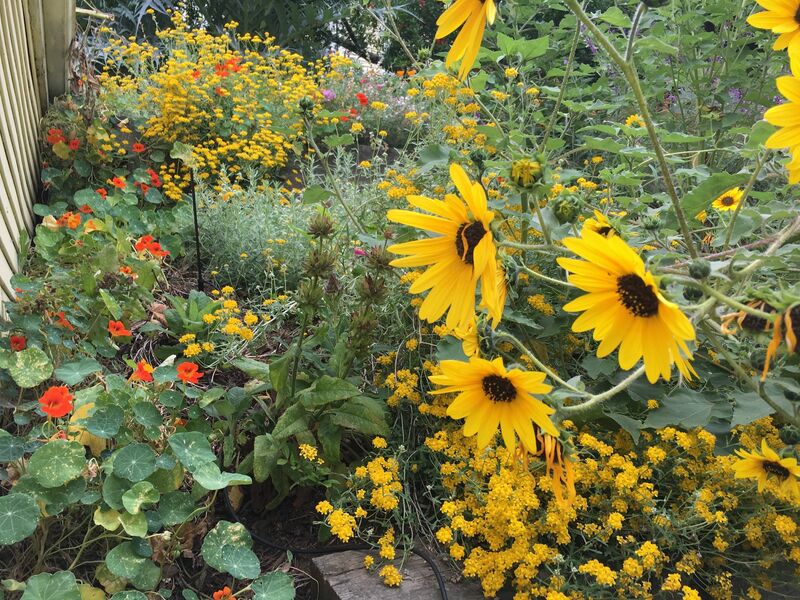 The sunflowers are the most obvious example, but I also have a patch of Mexican sage left over from the old days which I didn’t take out because the hummingbirds love it, and it feeds them during periods when bloom is low everywhere else, and because it is completely naturalized on the slope. It’s so happy and carefree, it seem a shame to take it out. I’m not sure if I could get rid of it, even if I tried! As it is, I keep digging it up as it tries to pop up everywhere, only allowing one stand to grow. But that stand is oppressing some of my other plantings. I suspect Piet Oudolf does not think like this. This is why he is Piet Oudolf and I’m the Crazy Sunflower Lady. On similar lines, I have a native sage on the slope as well, also leftover from the old days. It’s a great plant, but it wants to be large, and doesn’t really match my small scale meadow scheme, so I keep it, but I keep it trimmed back. Generally I don’t like “make work” schemes like that. Stuff should just be the right size for the space. Trimming is just a waste of energy for you and the plant. But I’ll leave it for now, and if I decide to give the slope over to the golden yarrow, I’ll let the Mexican sage and the purple sage go, too, and see who comes out on top. It would be like botanical cage fighting. Speaking of cage fighting, at the very top of the slope we have a cardoon plant. You can see it in the top left of the top picture. Cardoons are technically invasive plants and one of the bêtes noires of the native plant folks. I doubt we’ll ever be on a native plant garden tour with this monster crowning our so-called native landscape, but Erik loves, loves, loves this plant for inexplicable reasons, so I can’t take it out. The cardoon’s huge leaves are perpetually reaching out to overshade my natives, so I keep hacking them back (more make-work activity). However, I learned to like the cardoon much more this spring when I discovered it had become a ladybug nursery. I’ve never seen so many pupating lady bugs in one place. It was amazing. 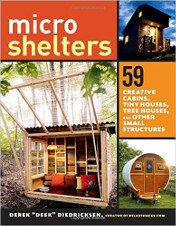 It probably housed more than 100 developing ladybugs at one point. And birds like that plant, too. They’re eating something off it–not the ladybugs, I think. So I guess it’s earning its keep. The first, front or bottom-most terrace on the slope turns out to have remarkably bad soil. 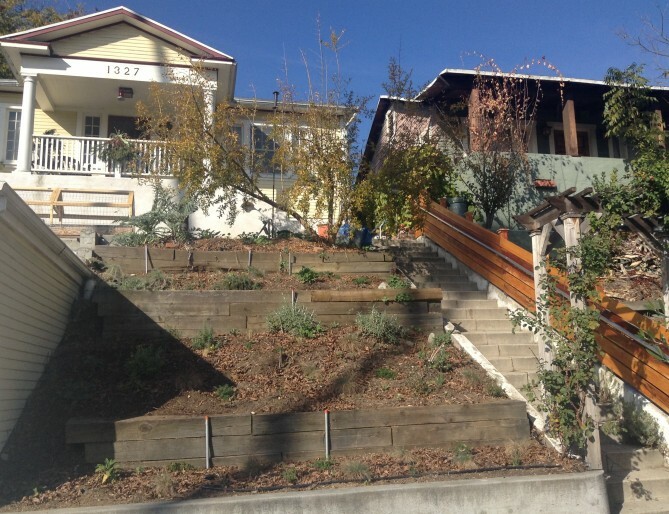 The whole slope has variable soil, due to construction digging, but the front terrace is really distinct: distinctly crappy, that is. 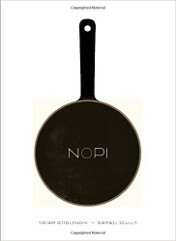 Its main problem is that it’s hydrophobic, and no other part of the slope is like that. Hydrophobic means that water doesn’t really sink into the soil very easily, and even after it seems to sink in, it sort of vanishes into the void, as if I never watered. It really is like a magic trick. The plants down there are alive, but much smaller than their peers above. And no wonder–they’re underwatered. The cure for bad soil is, as always, compost and mulch and worm poo. I need to add a lot of that stuff to this poor terrace, but I have a problem. The soil is already up to the top of the retaining wall–if I add more, it will spill all over the sidewalk. So I have a choice. I can add edging to give me a few more inches of depth for amendments, or I can dig up that terrace, pulling up the plants in the process, and hope they don’t mind being transplanted. Or I could leave it be, do small interventions like teas and hope the plants make it. These days I’m pretty much battening down the hatches for the long dry summer. Erik and I have installed a “smart” irrigation system to make watering easier (we’ll blog about that after testing it). I’m going to do a heavy mulching soon as the wildflowers and other spring annuals finish up. At that time I might have to make some decisions about the sunflowers. It will be interesting to see what the slope looks like without the sunflowers hogging all the attention. There are also summer and fall bloomers hidden in there, who will hopefully come to the foreground later this year. Overall, I’m happy enough to wait and see how this system stabilizes over time. It’s not perfect, but it’s not bad. It’s a little crazy, but it’s feeding critters, which is what it’s supposed to do, so I’m not complaining. I have the feeling it will look much different next year. We’ll find out! I’ll do a late summer/fall update to see how this thing looks in the dog days of the year. I’ve been putting off posting pictures of the plantings in our front yard because it just doesn’t look all that exciting at the moment. Everything is sleeping. If this was a HGTV show, we’d make the big reveal at this point, and show you a stunning new landscape. Instead, what I have to show you are a bunch of tiny little plants swimming in a sea of dead leaves. The leaves are a light mulch that I’m using to protect my little plants from our still-harsh sun and occasional 80 degree days. But it is truly all potential. 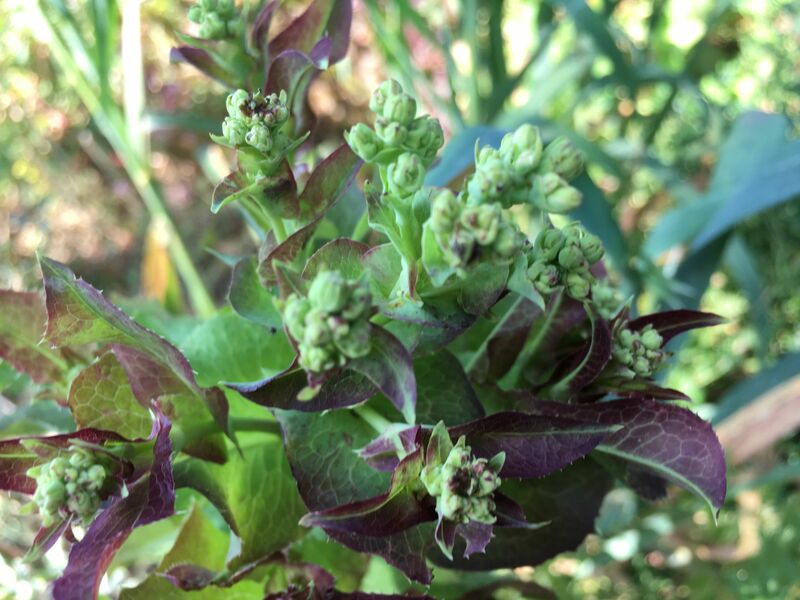 There are wildflower seeds waiting to sprout and other surprises to come. I hope to be able to show you something wonderful this spring. So stay tuned. 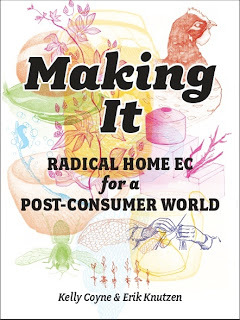 In the meantime, I will update this series if anything comes up– any new mistakes or discoveries or victories on the road to developing a meadow community. Doing this project has made me aware of how often we expect instant results with our landscaping, and how this haste often comes at a price. I don’t mean money, though that is true as well. So often the homeowner or the designer installs way too many plants, and plants them too close to one another, so there is an instant sense of fullness in a newborn landscape. It looks good for a while, but inevitably the plants start to choke one another out. This either results in a crazy looking landscape the year after the planting, or in lots of extra work for whomever is doing the maintenance, because they have to be pruning the plants back all the time to keep them in check. This isn’t only unnecessary labor, but it also wastes a good deal of fossil fuel what with the power tools and hauling, and if the clippings end up the landfill, the creation of methane gas. It may not be such a big deal in one yard, but it’s happening in thousands of yards, so the ill effects add up. The worst part is that it’s so very avoidable. We just have to learn to be a little bit patient. Rhubarb roots, as reproduced in Root Demystified. One square equals one foot. You’ve heard of grey water and black water–but what is green water? Well, if you’re a sailor, it’s a term for the water swamping the deck during a storm. That’s not what I’m talking about here. Amongst sailors of the soil (i.e. gardeners), green water is the water supply held around the roots of the plants. Water from rain or irrigation which does not run off the surface of the soil, nor run down through the soil to ground water, but which stays with the plant for its use. Green water is a plant’s envelope of life. It’s also a space of water storage which we don’t often consider. We’ll invest in a rain barrel, but we will forget the massive storage tank which nature has placed under our feet. If we have healthy soil in our yards, our plants have a baseline supply of water. It’s held in the space between the soil particles and in the bodies of the microscopic creatures which live in healthy soil. How much water? I don’t know, but the real answer is, enough. Plants acclimated to your local climate (natives or similar), living in spongy, healthy soil don’t need supplemental irrigation. Not even in the summer. (Drip line doesn’t occur spontaneously in the wild, after all.) Conversely, in times of heavy rainfall, healthy, spongy soils also resist flooding, swamping and rotting. By focusing on healthy soils, and allowing rain water to percolate into the soil, we empower the plants to take care of themselves. That’s better for them, and less work for us! We stop adding fertilizers to our yards, even organic ones. They actually collapse the soil structure and make the plants into fertilizer junkies. Mulch, compost and worm castings are all a yard needs. We design our yards so they capture and hold rain water rather than ejecting it straight to the street. We leave the leaves. We keep our clippings and fallen leaves on our land, and let them return to the soil. Mulch is is vital to living soil, while bare soil is dead soil. We make our yards lush. 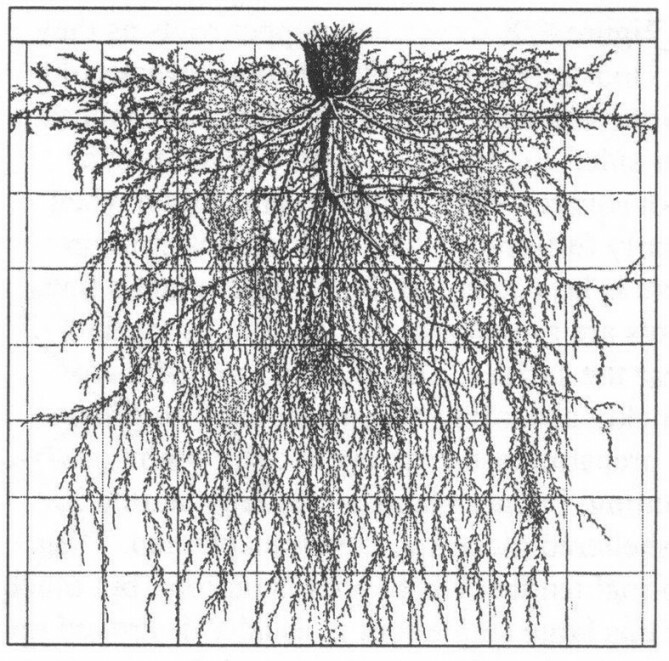 Soil life occurs around the root zones of plants, so more plants means better soil. Okay, I’m back to the series which never ends after a break for flipper fence building, Thanksgiving and a few days nursing a cold. I’ll get into the details of the community building, but I’ll say first that I’m not so sure about all of my decisions, but they’re done. In the world of the DIYer, there’s a big gap between the idea, and what actually gets executed. Then again, that is true for most art. I spent a lot of hours researching plants, trying to find plants which would work together as a community, had low water needs and which would provide nearly continuous bloom over the course of the year. It’s a puzzle that runs in four dimensions, the fourth dimension being time. I’ve been doing this long enough to pretty much expect a certain percentage of these plants will not do well…you know, just ’cause. And then I also expect that once stuff comes in and starts to come together, I’ll have to make changes or fill gaps. Editing comes with the territory. If I’d had more lead time, I wold have grown more stuff from seeds and cuttings–so I’d have had more options and saved a lot of money. Isn’t that always the case? You pay for speed and convenience. I know this. But I really wanted the plants to have a chance to root down a little before our torrential El Niño rains hit in January. At least our money is going to a worthy non-profit. So, that’s the end of my excuse-making and complaining. The structural layer: In a grassland, this includes tall grasses and species with tall flowers which will poke up above the rest, preferably too, these flowers will form interesting dried seed heads or pods for continuing visual interest. Think milkweed, for instance. These should make up 10- 15% of your community. The seasonal theme layer: These are plants chosen to add seasonal interest either through bloom or texture. So for instance you might choose certain plants for their spectacular spring bloom, knowing they will act more like green companions to the other plants for the rest of the year. Ideally you can mix this category up enough so that you have continual interest in the garden. Think irises, for instance. These make up 25-40% of your community. The ground cover layer: These plants are more functional than showy–shade tolerant plants like low grasses and creeping ground cover which will suppress weeds and help anchor the soil. Rainer and West admit that this is often the most difficult category for folks to fill, because nurseries sell flashy plants, not sturdy background players. Think sedges. These make up about 50% of your community. The dynamic filler layer: These are short lived, opportunistic species which will self seed and pop up whenever there is a temporary space to exploit. Think about wildflowers, for instance, which show up first in the spring, and fade away as the perennials come back to their own. These make up 5 -10% of the community. Now, this sounds pretty straightforward, but once you get into the weeds (so to speak) it gets a little confusing. I wasn’t always able to decide what category a plant should be in. For instance, yarrow (Achillea millefolium) is a seasonal theme layer plant, but it is low and spreading and works rather well as a ground cover when not blooming. It’s usually considered a sun-loving plant, but our sun here is not like normal sun, it’s SoCal SunPlus! ™ and the slope gets a lot of it, so I don’t think the yarrow would mind if it got some shade from tall grasses and the like. 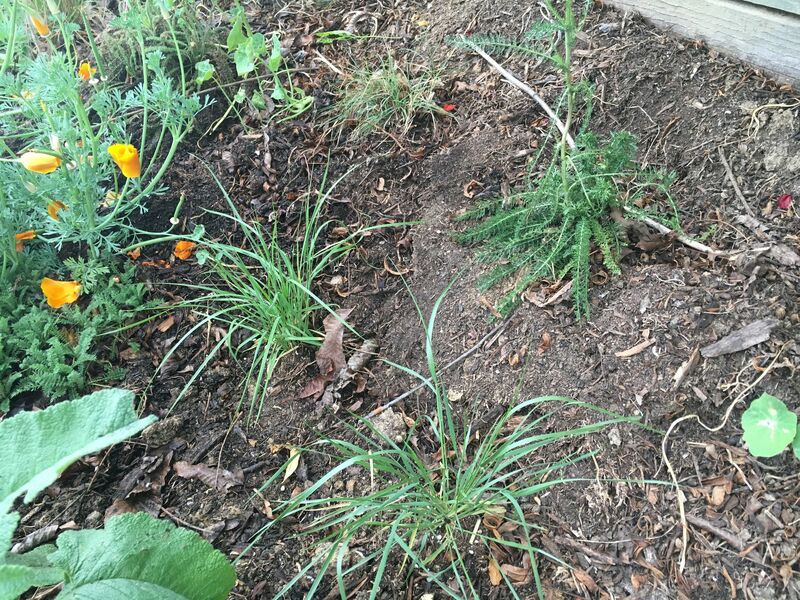 Basically, since I like yarrow, and already had it growing on the slope, I just doubled down and planted a lot of it, making it sort of do double duty as both theme layer and ground cover. All of this is to say, I fudged through the categories. If the garden is a design disaster, it’s not Rainer and West’s fault. My ratios don’t line up exactly with theirs, but they are not crazy far off. I found it was hard, as they said, to find much choice of ground cover plants–especially in the drought tolerant category. I know I don’t have enough. I think if I were smart now I might start some interesting grasses from seeds to fill the inevitable holes which will form as some of my selections die. 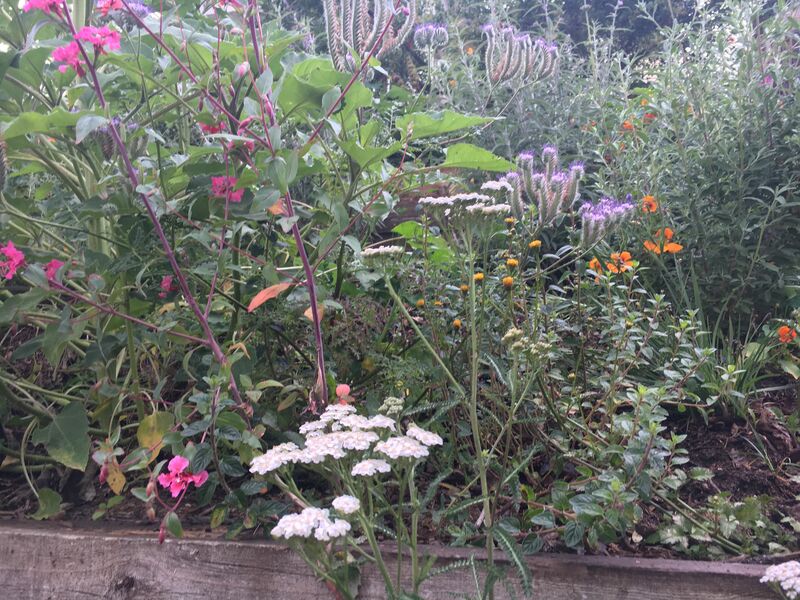 My primary goal for this mini-meadow was to provide food and habitat for insects and other small critters. My secondary goal is for it to be an attractive front yard landscape. Both of these criteria hinge on the plant choices being sufficiently dynamic to keep the yard interesting for both people and critters. I started keeping notes on the plants I liked with all their basic stats, including their bloom time. The notes got so out of control that I was forced to make a spreadsheet. Now, some people really like themselves a spreadsheet, but I am not one of them. The fact I was forced to make one only shows how much information there is to juggle in this process. 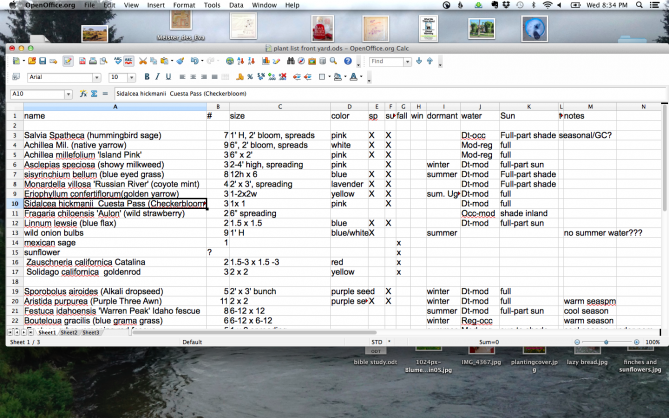 In fact, I began to wish I knew more about spreadsheets, because more functionality would have helped at times–like, being able to arrange the list by bloom time or color or whatnot. But I was content enough just to have it all in one place in standardized columns. Sisyrinchium bellum (Blue eyed grass) This is an pretty little grass-like plant with tiny blue flowers, very meadowy. Pro: it’s a self seeder! Con: It’s summer dormant, meaning it will leave holes in my landscape in the dreary height of our long summer. Monardella villosa ‘Russian River’ (Coyote mint) This one is new to me, a small leaved creeping plant with purple blooms the insects just love. The foliage is also gently mint scented. I planted this along the terrace edges so it can spill over and hide our ugly retaining walls. I also planted it closer to where people walk, so we can smell it. Eriophyllum confertiflorum (Golden yarrow) This is a small shrub, not a true yarrow at all, with “ladylike” habits and proportions. It blooms more in the summer, so is valuable, as so many plants want to do all their business in the spring. Sidalcea hickmanii “Cuesta Pass” (Checkerbloom): This is a cute little miniature mallow. I bought it on a whim because it is so very endangered. It’s called Cuesta Pass because it only grows in the Cuesta Pass anymore (and at the Theodore Payne nursery). Unsurprisingly, it strikes me as fussy. Fingers crossed it will like our slope. Linnum lewsie (Blue flax): This is another excellent meadow-y meadow plant, made to peek up between the grasses. The problem with unfamiliar plants is that they are unfamiliar. It’s nice to know the ways of a plant when you choose to use it in a landscape. Many of my selections are complete mysteries to me. That can be fun. I’m really curious to see how they’ll grow in and what they’ll do. It’s also a little nerve wracking. 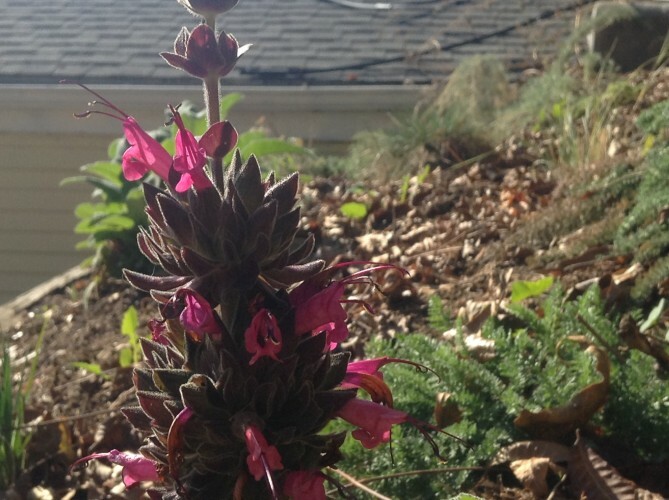 In this seasonal interest category, beside the plants already listed, and the yarrow which I mentioned above, I’ve also got a good deal of Salvia spatheca (Hummingbird sage) planted, and a few other things that I can’t remember right now. My goal was year round blooming. I don’t think I quite have that ( the November–February period is drab, even here), and what I do have is not equal. Spring is glorious. It’s easy. That’s when everything seems to want to bloom, and all the foliage is lush. That’s when we take pictures of the yard, so we look like we know what we’re doing. Some plants will bloom intermittently though the spring and summer and into the fall, dragging out the show, but I’m just going to have to see how much of that happens. There are far fewer late summer bloomers to choose from. I’ve planted native goldenrod (Solidago californica) even though it can be an rangy, weedy terror, simply because butterflies love it and it blooms when everything else is dead. If it takes over the slope, I’ll have to come up with a plan B. I’ve also got a few Zauschnerias (California fuschia) in place for later summer into winter bloom, and am really hoping that wild sunflowers will show up give the slope some fall color and happy chaos. As I said above, I need more, I suspect. Instead of being too heavy on the grasses, my meadow might be too…random. Too insufficiently grassy to be meadowlike. The world of grasses is confusing, especially as regards dormancy. Some sleep in the winter, some in the summer. Okay, but how bad will they look while dormant? Will they vanish or just look pleasantly dry? Some avoid dormancy if you give them water. Some die if you give them water at the wrong time. Oy! Save me from our crazy native grasses. Right now I have three species of native bunching grasses on the slope. The first is Sporobolus airoides (Alkali dropseed). This is the tallest of my grasses. It gets to be three feet tall, with more height from the seed heads, I believe. It’s showy, with nice airy seed heads. I planted it in the “back” portions of the slope, i.e. the furthest from the street and stairs. (As one of my aunts once said of gardening, “I finally have gardening figured out: tall stuff goes in back!”) This way it doesn’t block other plants, and it will be pretty when backlit by afternoon sun. It also serves to hide the retaining walls and other ugly bits of infrastructure. It falls under the structural category because it is striking, more of a diva than a backgrounder. The second is Aristida purpurea (Purple Three Awn). This is also a lovely grass, just not as tall as the Sporobolus. I used a lot of it –it’s one of the backbones of the slope, so I hope it’s happy and looks right. By the way, it’s not a purple grass–the purple in the name refers to the purplish cast of its seed heads. As far as categories go, I sorta decided in my fudging way that it must be a seasonal theme plant, mostly because it ain’t groundcover and it ain’t a structural plant. Probably. The third is Festuca idahoensis ‘Warren Peak’ Idaho fescue. This is a small fescue which is drought tolerant, which I am using in the groundcover role. It’s okay in that role, but I need more groundcover which spreads on its own. This fescue sits in polite clumps, waiting to be divided. But you know, they had lots of it at the nursery, and it will fill up some space with short grassy goodness. Good enough! In general, I need more ground cover. One idea I have is that I have some wild strawberry growing in the shade under the pomegranate at the top of the slope. It’s beginning to take off after a slow start. I’m going to root some of it and introduce it on the slope, where I think it will be okay in the shade of taller plants. Community. 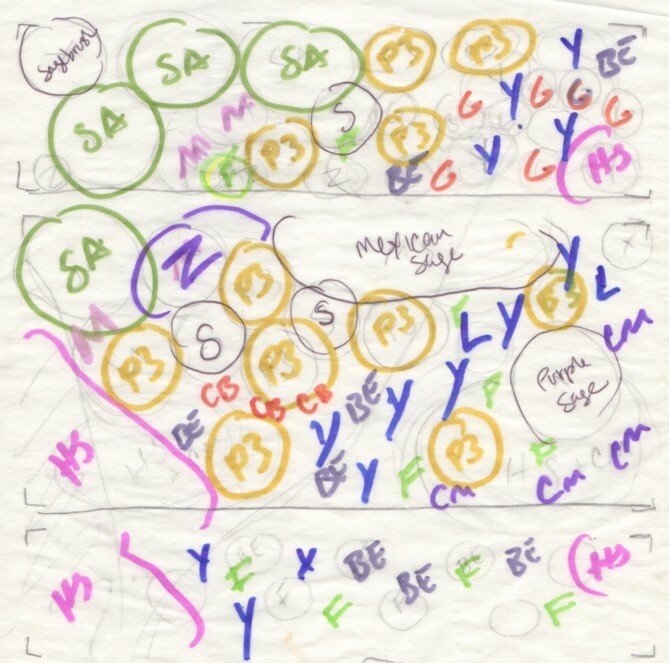 I understand how to make the plant groupings work aesthetically–in theory, at least– but I’m not enough of a botanist to understand their more hidden interactions and relationships to one another and the soil and the world at large. Natural plant communities are extraordinarily complex. Communities designed by master designer/botanists are pretty complex. My community is…well, a little random. What do I know about what plants want or need, much less how they interact with each other? But I do have faith that the plants will tell me what they want–if I listen closely. This means that some of my ideas will be jettisoned (plants will die) and some unexpected things will probably happen, and I’m ready to go with all of that. I’m just waiting for my orders.